I’ve been growing indoor plants since my first dorm room. They look nice, smell good, produce oxygen, sometimes make pretty flowers, and make a room feel alive. Nowadays, so much of my life is virtual, getting my hands dirty is a real pleasure. When people come over to the house, they usually compliment me on my green thumb, but here’s the secret: There is no such thing as a green thumb. Or, if there is, you already have one. 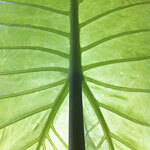 Houseplants are easy to grow, and I can prove it. If you’re the kind of person who says that you can’t keep a plant alive, this single blog post will teach you everything you need to know to keep a plant alive in your house. Plants are just biological programs. They have four inputs: water, soil, light, and their environment. Environment means air temperature and humidity. Most of us have no control over these things, and that’s okay. I’ve lived in apartments in San Francisco with no air conditioning (you don’t need it here) and crappy electric heaters (which never worked) and had perfectly happy indoor plants. So don’t worry about controlling the environment for now. Just get plants that are likely to thrive in your environment. Soil, if you’re buying potted plants, comes with the plant. You can generally assume that they picked the right kind, so this is another thing you won’t have to worry about at first. You may need to repot a thriving plant, but that takes years. So, of a plant’s four inputs, you’re already done with two, and you haven’t lifted a finger yet. See how easy this is? The two you have to worry about are light and water. If you have an unhappy houseplant, one or both of these things are probably off. Water. I water once a week. It’s okay to let most plants dry out in between waterings, but if the leaves droop, it’s time to water. If leaves go brown, the plant may not be getting enough water. If the leaves go yellow, it’s getting too much water. Standing water is bad, because roots can rot. Make sure water can flow through the pot. If it’s small, pick it up and put it in the sink, give it a good soak, and make sure water’s coming out the bottom. If the plant is too big to be picked up and put in the sink, make sure it has a saucer and water it slowly until you see water come out the bottom. Have a towel ready for when you over-water. It happens to the best of us. Years ago, I had a bunch of houseplants that all started to droop around the same time. I asked for help at my local garden store, and the proprietor asked, “What kind of fertilizer are you using?” The answer was, none. The plants had been fine for years, but had finally used all the nutrients they could get out of the soil. A little fertilizer and they perked right up. So buy a simple liquid fertilizer, but use it sparingly. Too much fertilizer can kill a plant. Light. Plants are solar-powered. I can’t tell you how many times a friend has asked me for help with a plant, and I came over to find it in a dark corner. 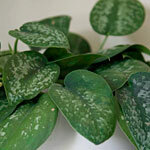 Most houseplants like bright, indirect light. So pick a window that’s bright, but not in the direct path of the morning or evening sun. Often this means a north- or south-facing window, but it could also be an east- or west-facing window that’s partially obscured by something outside. If your plant’s leaves are withering, turning brown on the edges, or developing brown spots, that means it’s getting too much light. Move the plant away from the window a bit. If you don’t have a houseplant already, go get one. Here are some shopping tips. Buy small plants. The fun part of having plants is watching them grow. So don’t go buy a huge, well-established plant. You don’t have to go to a plant store to buy a plant. 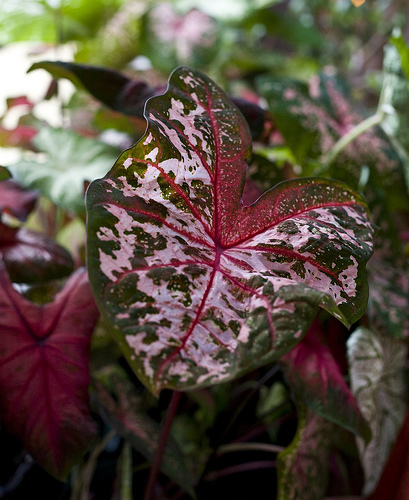 Some of my longest-living houseplants were bought from grocery or hardware stores. Think of it this way: If a plant is hardy enough to survive a week on a shelf next to the breakfast cereal, it should be able to live in your house. When considering a plant, make sure the stalk is dense and not squishy. But don’t just examine the plant, check the soil. Stick your fingers in and make sure it’s not moldy. Look for bugs under the leaves and in the soil. Sniff it. It should smell like wet earth, not a stagnant pool. Buy cheap plants. Some of my favorite plants came from the 99-cent bin because they were a little weird. I’m a little weird, too. If you can revive them, they’ll reward you with amazing growth. If you can’t, well, you only lost a buck. Find the employee that’s tending to the plants, and strike up a conversation with them. They’re almost always nice and helpful. They’ll know the plants better than anyone. If you describe the room you’re buying for, they’ll help you find the right plant, and advise you on how to care for it. Buy plants in plastic pots, and get a clear plastic saucer to go under them. Do not but plants in baskets or pots without drainage. You have to be able to see when water comes out of the bottom to learn how much to water. Also avoid pots that have several different plants sharing the same soil. It’s just too complicated to get everything right for all the plants at the same time. If you want your plants to be in a nice pot, get a ceramic or metal pot and put the plastic pot inside the nice pot, instead of physically transplanting the plant from the plastic pot to the nice pot. Having the plastic pot inside the ceramic pot allows you to swap plants between the nice pots, and also allows you to pull the plastic pot out to see if there’s standing water in the saucer. 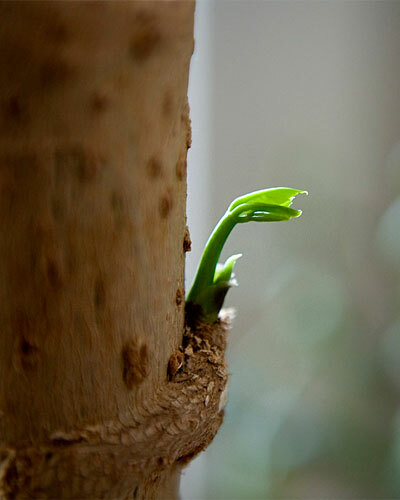 If you’re just starting out, don’t buy finicky plants like Ficus, Orchids, or African Violets. You can work up to those. Now that you’ve got a plant in a plastic pot, with a saucer, in front of a window, all you have to do is keep it alive. The good news is, plants want to be kept alive, so they talk to you. You just have to learn their language. Strong, green leaves are generally what you want. Brown means too much light or not enough water. Yellow means too much water. 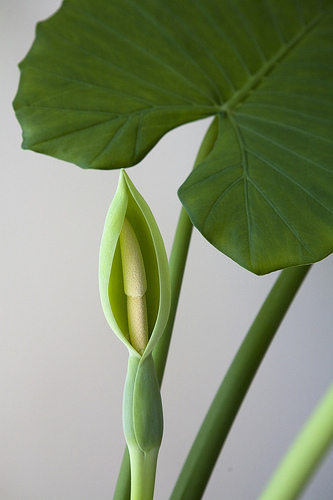 Flowering usually means the plant is happy, but some plants will flower if they think they’re going to die. Some plants will drop leaves if they’re unhappy, but others just drop leaves as they grow. Point is, every plant is different. So get to know your plant. Just check them every day, and see what changes. Dust collects naturally, and it gets in the way of the leaves making energy out of sunlight. So if your plant is dusty, you can occasionally take a damp cloth to the leaves and gently wipe off the dust. This is more important for plants with big leaves. Do not use a vacuum cleaner. Trust me. I tried. Many houseplants originated in jungle-like environments, where there’s a lot more humidity in the air. So if you live in an arid environment and want to be nice to your plants, you can get a simple mister and mist your plants occasionally. I often mist my plants when I’m waiting for the toaster or on the phone. It’s not required, but I think it helps them, and it’s a nice calming ritual for me. Remember that plants live in slow motion. So any change you make today won’t make an immediate difference. Sometimes you won’t see a change for weeks, even when you’re doing the right thing. So, above all, be patient. One of the first plants I ever bought was an Umbrella Tree. I got it at Long’s Drugstore in Santa Cruz for $3.99 in 1991. Since then, it’s grown to the ceiling, twice. It’s lived in a dozen different rooms in several cities. It’s now in my living room, still growing. As plants mature, new issues emerge. The soil, which I said you could ignore at the beginning, is now important. There’s only so many nutrients in soil, and they run out. Remember, these plants were designed to live in the ground, which is a living ecosystem. As a potted plant, they’re like little space stations. If they live long enough, they’ll use up all their nutrients and run out of space to grow. Also, some plants come from bulbs, which are like big seeds. These plants will make baby bulbs that split off from the parent bulb. Give a plant like this enough time, and the bulbs will crowd out the soil. I just repotted an African Mask plant that had become one huge mass of bulb babies. It had to be repotted into five pots. So if a previously happy plant starts to seem unhappy, and you haven’t changed your routine, they may need to be repotted. Fortunately, it’s easy. Just get a bigger pot and some potting soil. Gardening stores will sell soil specifically marked for indoor plants. You might want to do this outside, since it’s messy. Pull the plant out of its current pot and marvel at the network of roots that have formed at the edge of the soil. You’ll have to break up the roots a bit, so that they’ll notice the new soil. Then set the plant in the new pot and pour soil around it. Pack the soil in tight, give the plant a big water, and let it drain completely. Congrats! You’ve repotted. Some plants also need to be trimmed to make sure they don’t get too big or unbalanced. Don’t be afraid to trim aggressively. If a plant is healthy, it’ll come back. The aforementioned Umbrella Tree has been cut back to a stump twice, and each time it bounced back strong. Watch out for critters! If you see little insects on your plants, go get a gentle bugspray for houseplants. It’s basically a soapy spray, and you may have to mist the plant with it every day for a week to do the job. If you have house pets or kids, make sure you get a nontoxic bugspray that won’t hurt them. 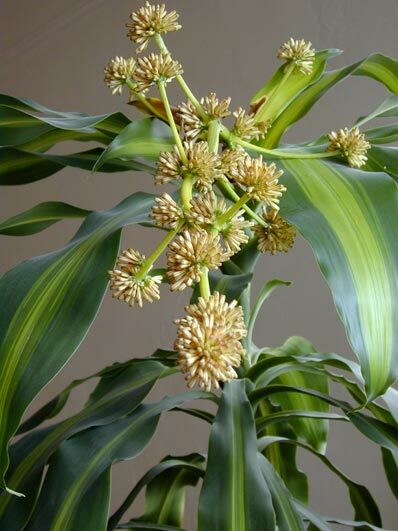 The worst case of bugs I ever had was an ant colony that took up residence in a Dracaena. I tried all the gentle bugsprays I could find and nothing worked. I finally took it outside and doused the soil with Raid. It worked, but it almost killed the plant. Not recommended. The most important thing to remember is this: It’s not personal. Sometimes you obsess over a plant and it still keels over on you. Other times you forget to water for two weeks and your cat uses it as a litterbox and it thrives anyway. Plants are living things, and living things are complicated. If your plant dies, I’m sorry. It’s probably nothing you did or didn’t do. The environment may have just been wrong for that particular plant. Try again with a different plant. Ask for advice at your local plant store. Try again. If your plants look great, feel free to take credit when your friends compliment you on your green thumb. But know that it probably has very little to do with the color of your thumbs. You just lucked into the right plant in the right spot. Smile, enjoy the beauty it brings to your life, and then go get another one. It wasn't much more than a stick with some roots, still circling an invisible pot. How to make sure your plants will still be healthy and happy when you get home from vacation.